Tom Feran and R.D. 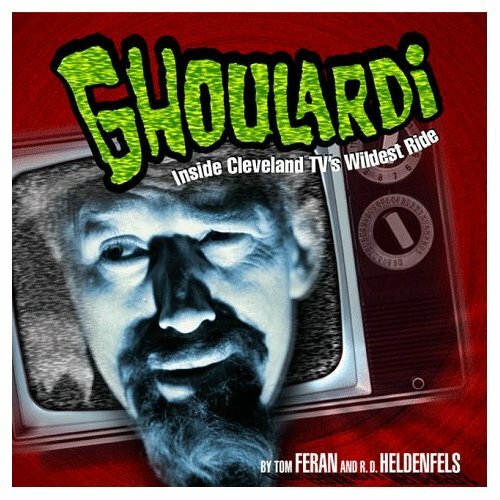 Heldenfels book Ghoulardi: Inside Cleveland TV’s Wildest Ride documents how Ernie “Ghoulardi” Anderson, through the Ghoulardi character, captured the imagination and energy of Cleveland the way that a lot of the initial horror hosts did during the early sixties. The book details the creation of the ‘Ghoulardi’ character, from his conception from make-up designer Ralph Gulko to the execution from jazz-loving and cool-talking Ernie Anderson. Ghoulardi goes over a good build-up on Anderson’s history, how he traveled from Boston towards Cleveland and the work he did prior to donning the van dyke mustache/beard and fright wig. His relationship with Tim Conway is discussed as is the general attitude towards Cleveland and how Cleveland took to Ghoulardi. 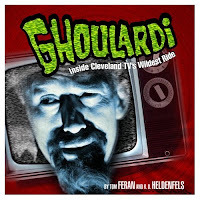 It’s clear from reading Feran and Heldenfels’s book that Ghoulardi tapped into some youthful energy, capturing the budding imaginations of that Midwestern generation. Ghoulardi is a good summary of the persona. I would have enjoyed if there were ten to twenty more pages highlighting jokes, since there’s no real online video library. But Feran & Heldenfels do a good job in presenting an idea of Ghoulardi’s humor, of his aesthetic, of who the character was. From reading this book, I got a good overall idea of Ernie Anderson in Cleveland, of his work on ‘Ernie’s Place’ with Tim Conway, of the time as Ghoulardi, of his charity work as the character and his less-than-charitable barbs he launched at the city that was his adopted home. As all things, time was that which ended Ghoulardi. Had the character remained the counter-culture icon of cool he was before rock and roll, if the Beatles not changed the landscape of teenage hipness, Anderson might have remained in Cleveland for a little longer. Ghoulardi wasn’t a job, it was a persona. It was tied to attitudes and actions that Ernie Anderson had himself, to rebelling against management and authority and somehow getting away with it. It was a side to Ernie Anderson, one that would drive his golden Honda motorcycle through the television office during his weekend shift, from the lobby, through the hallways and into the News Director’s office; the part that said “you get a girl and you ‘poke ‘er’ while live on the air. His success might have spread the character too thin, but it the world changed for Ghoulardi. He had, as a TIME magazine article once said, “caged nearly every teen-age mind in Cleveland,” but the mind is only caught for so long. Three years is a lifetime for the mind and when it was time to move on, so did Ernie Anderson. He left Cleveland and Ghoulardi behind. Ghoulardi exists as an example of how to rebel and get away with it, that the rules that seem in place might be worth breaking, if not bending enough to have some fun. You can make fun of the movies. You can light off fireworks in the studio. You can look at your world around you with a loving eye but also point out its silliness. You can turn blue, stay sick and cool it.